Councillor Jim Gifford, leader of Aberdeenshire Council at Woodhill House, Aberdeen. 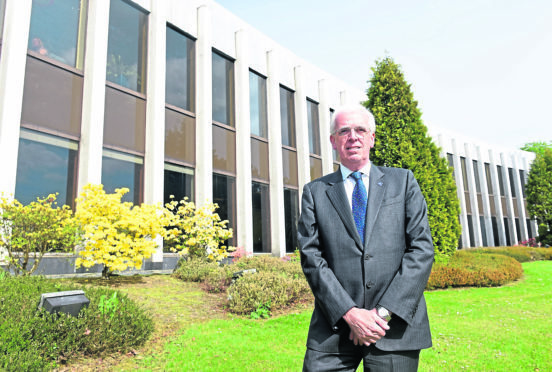 A north-east council has refused to rule out cutting jobs as it attempts to overcome a gaping deficit of almost £30 million. The authority is facing a £27 million funding gap, and both the administration and opposition have said they are looking at every option to fill the void. A report which will be discussed by councillors next week has calculated savings which would require 150 jobs to be scrapped. Both the administration and opposition have already committing to raise council tax by 3% and now it could be raised a further 1.79% in line with the Scottish Government’s threshold – which sources say could could generate £2.3m for the authority. The council has a revenue budget for the next year which amounts to £565m, with the local government settlement sitting at £422m, putting it into the bottom three lowest-funded authorities. Council leader Jim Gifford stressed that compulsory redundancies would be a last resort and that although voluntary losses would also be an option, they would only be considered after “vacancy management”. This might entail not replacing staff who leave, transferring people to other departments and tactics such as reducing overtime. He said: “That’s the figure that we have arrived at by working out the average salary. “We’ll go through every possible way of making that happen without making people redundant. “Things like vacancy management, service reviews, transferring people from different departments where people maybe have more of a budget, before we do look at voluntary redundancy, which we have done on occasion, and compulsory redundancy – that is an absolute last resort and one we haven’t done in my time at the council. Mr Gifford added that it “remained to be seen” whether the administration would raise council tax further, but said it would be considered. This financial year the council is looking at a £4m overspend and is striving to reduce that before the end of next month. The cost has been pinned on factors outwith the council’s control, such as out-of-authority placements for people who require specialist care where there has been a “significant overspend”. And while the money is within 1% of the overall revenue budget, Mr Gifford has acknowledged that £4m is still a “significant chunk of change”. Senior finance officers will look at vacancy management, reducing overtime and reducing temporary staff before voluntary severance was explored. Peter Argyle, deputy leader and infrastructure services chairman, said it was never easy to cut services. He said: “We know from the recent changes that we’ve introduced with waste collections that the immediate reaction is one of dismay, but actually once people understand what we’re doing and why we’re doing it, this is they key to everything.